The MAC Championship Game is lined up, but several other teams are fighting for bowl bids. We’ll look at the bowls and who might be going, while previewing this week’s games as the regular season comes to an end. First let’s sort out the bowl picture. 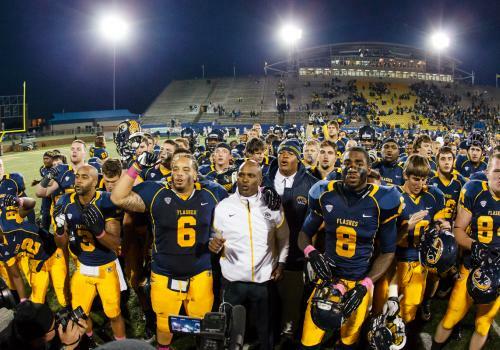 Kent State and Northern Illinois are headed to the Marathon MAC Football Championship on Friday Nov. 30. This game will be on ESPN2 at 7:00pm. The winner of that game goes back to Detroit on December 26 to play a Big Ten team in the Little Caesars Pizza Bowl. The runner-up goes to Mobile, AL on Jan. 6 to play in the GoDaddy Bowl to play the Sun Belt runner-up. The third best MAC team goes to Boise, Idaho to play on the blue turf in the Famous Idaho Potato Bowl. With all of the bowl eligible teams this year, they may also be selected to play in the New Mexico, Beef O’ Brady’s, BVVA Compass, Heart of Dallas, and/or the Poinsettia Bowls. So far six teams are bowl eligible, with Central Michigan (facing UMass) on the bubble this week. Kent State puts their 7-0 record and 23rd ranking on the line this week with the team chosen by many to win the East, the 4-3 Ohio Bobcats. Kent is riding a school-record seven game winning streak, and this will be their first bowl game since 1972. They have improved over their 2010 and 2011 record of 5-7. Kent uses a power running game featuring Dri Archer (1,284 yards and 14 TD’s) and Trayion Durham (1,079 yards and 13 TD’s). Another key stat for the Golden Flashes, which I’ve also been mentioning all year, is their Division I-A leading 21 interceptions. Kent’s one loss was to Kentucky in week two, a lousy game they all wish they had back. The Bobcats were a team of destiny. Behind coaching legend Frank Solich they played the easiest schedule in I-A football. There were TV shows filmed at their training camp, weekly TV shows, the rags and websites were infatuated with them. And when they beat Penn State in week one on national TV, it got all the more certain. Then came the conference schedule… Narrow escapes from UMass, Buffalo, and Akron made skeptics of some of us, looking forward to seeing them against "real" opponents. With a bye week to prepare, they lost to Miami 23-20, hosted Bowling Green and lost 26-14, and then getting destroyed last week at Ball State 52-27. The result, a 4-3 record (8-3 overall) and a season ender Friday night on the road against MAC Cinderella. On national TV. The Bobcats also have a potent running game behind Beau Blankenship (1355 yards, 11 TD’s) and can pass with Tyler Tettleton (2281 yds, 16 TD’s). The defense gives up about the same number of points per game as KSU (just over 25). But, they’re on the road, and they are on a two game losing streak in which they lost by 37 points. They also don’t have the big-play Dri Archer/Flashes secondary. “Can’t State” can this year, and finish the season 8-0, winning big on ESPNU. The carnage starts Friday morning at 11:00AM. Another key matchup in the East pits Bowling Green against Buffalo at home. Bowling Green sits solidly in second place in the East, but this game has huge bowl implications. Toledo (or Ball State) will get the invite to Idaho, that leaves BG waiting for one of the other bowls to come calling. The Falcons are coming off a loss to Kent State, while the resurgent Bulls team is on a three game winning streak. They still have the 9th ranked defense in I-A, giving up only 16.5 points per. Matt Schilz has almost 2200 yards passing with 13 TD’s, while Anthon Samuel needs 30 yards for 1000 togo with 10 TD’s. The Bulls have a power running game, with two backs averaging 5+ yards per run. Branden Oliver has 801 yards and 5 touches, while QB Alex Zordich has 501 yards and 1 TD. Buffalo is streaking, but that includes games against WMU and UMass. Not quite BGSU-caliber. The Falcons rebound to win this on easily. ESPN3 carries this game at 2pm. Ball State has a shot at being the third-best MAC team, with the invite to the Famous Idaho Potato Bowl that goes with it. A win ties them with Toledo with identical 9-3 6-2 records, and Ball State won head-to-head. Standing in their way is a trip to Oxford to play the Miami RedHawks. Miami has been a disappointment this year, going into the final game 4-7 (3-4) and on a 3 game losing streak (including Buffalo and Central Michigan). The loss to Cincinnati seems to have taken the wind out of Miami’s sails, the only win since then was the 23-20 upset over Ohio. The Cardinals come in with a five game winning streak, including wins over #25 Toledo and Ohio. Zac Dysert (3265 yards, 23 TD passing and 223/2 rushing) is the key for Miami to pull off the upset. It won’t be enough to offset Jahwan Edwards (1223 yards, 6.1 per, 11 TD’s) rushing. Ball State goes bowling. Northern Illinois goes to Eastern Michigan (1-6) in a tune-up for the title game. God help Eastern Michigan. This thriller is on ESPN3 at 1pm. Central Michigan (3-4 5-6) goes to UMass (1-6 1-10) gunning for a .500 season. Technically they would be bowl eligible. Technically. One more game and it’ll be all over. I didn’t do a preview for Akron @ Toledo Tuesday night, but I doubt anybody needed one. Toledo came in soft, licking their wounds after losing to Ball State and Northern Illinois. Akron got out to an early lead, Toledo woke up from their funk and adjusted to Akron’s game. Akron again failed to adjust to Toledo’s game. Final score Toledo 35 Akron 23. And the first season of BowdenBall is mercifully over. Looking ahead, CBS Sports has NIU winning the title game and playing Western Kentucky in the Little Caesars, Kent State playing Louisianna Lafayette in the GoDaddy, and Toledo playing Utah State in the Potato. They have Bowling Green playing La.-Monroe in the BBVA Compass, Ohio U playing Troy in the Military, Ball State playing Tulsa in the Liberty, and Central Michigan (??) playing Utah State in the New Orleans Bowl. Seven teams in bowls, I'll take that.